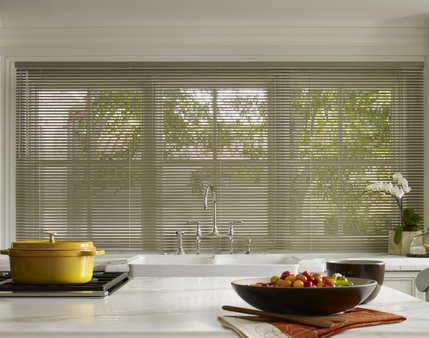 From Standard to premium, we offer an aluminum blind to fit any window and blend with any décor. Available in a wide array of colors and styles including whites, pastels, jewel tones, metallic, and pearlized finishes. Spring-tempered slats – resist damage, they bounce back. Dust resistant finish repels dust and makes cleaning easier. Crash-proof cord lock and easy-tilt wand make operation smooth and effortless. Lockseam bottom rail provides added durability and resists bowing. Break-Thru Safety Tassel helps protect children and pets. Limited Lifetime warranty ensures your customers’ satisfaction. Spring-tempered .008 gauge slats available in a full palette of decorative colors and styles. Heavy-duty headrail with built-in valance adds fashionable appeal. LightsOut room-darkening feature – standard on every blind – blocks out unwanted light and increases privacy. 18mm ladder spacing provides maximum slat overlap to ensure a tight closure. Crash-proof cordlock and cast metal slip-clutch tilter provides smooth, reliable operation. Snap-in mounting brackets are hidden from view. Spring-tempered .006 gauge slats available in best-selling and colors. Limited selection of .008 gauge slats colors also available as an upgrade. Heavy-duty standard headrail with crash-proof cordlock and cast metal slip-clutch tilter ensures smooth, reliable operation. Two-slat channel valance adds a finished look. Color-matched box brackets are easy to install.